It was probably 1958. Maybe 1959. But most likely 1958. And it was the Worst Christmas Ever. Most likely, I was seven, going on eight years old, and my sister Diana was 9, going on 10. A bit older than we are in this photo, but this’ll have to do. Given the times, and considering my age, I might have had another year or two with Santa, had I not started school at four. But I was in the third grade already, with kids up to two years older. I’m sure it had been a topic of conversation for weeks before December ever arrived that year. Now Diana had never said anything to me about Santa Claus not being real. So I can’t quite remember how the idea came up. No, it was almost undoubtedly my idea. The idea to stage the Great Christmas Closet Caper. You see, in the great big Dutch colonial house where we grew up, the master bedroom had these his-and-her closets. And for at least two or three weeks before Christmas each year, our mother’s closet was definitely Off Limits. In other words, that’s where all of our Christmas gifts were stashed. Diana’s. Mine. And those for the two younger siblings who’d come on the scene by then. But we didn’t care about their presents. We cared about ours. And since, after all, Santa wasn’t going to be watching to see if we were good or bad, what could the harm be in checking things out in advance, anyway? How we managed to have uninterrupted access to the closet isn’t something either of us remembers any more. Chances are pretty good that we were supposed to be doing something else, like keeping an eye on the younger kids. Since we didn’t get caught, I’m pretty sure the presents weren’t wrapped yet.3 But, one way or another, we found the opportunity, and the time, and we carefully examined the contents of the entire closet and figured out every single solitary blessed thing that would be under the tree on Christmas Eve. We found out we were getting most everything we really, really wanted! The closet raid was a complete success! It was the perfect caper! It was absolutely positively… awful. Like the crash after the sugar high, our Christmas spirits crashed within hours. The anticipation… the speculation… the maybe-yes-maybe-no of the days leading up to the Big Event… the very wonder of Christmas Eve for a pair of gradeschoolers… all of it… gone in a few minutes of snooping. No need to shake that box under the tree. No reason to wonder if maybe this box had that inside. Not one whit left of that delicious agony of waiting and hoping and being sure-but-not-but-sure-but-not. Yes. my recollection and Diana’s, when I checked with her yesterday, is that we got most, maybe even all, of what we really wanted that Christmas. All but the one thing we ourselves had given away: the joy of uncertainty. It was, without a doubt, the Worst Christmas Ever. 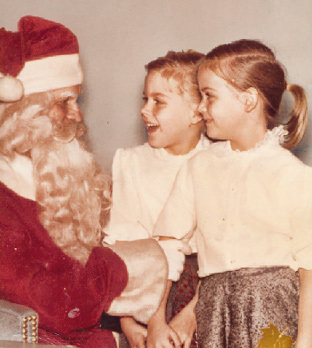 When my daughter was quite young, a neighbor would dress up as Santa on Christmas Eve. If you left a gift on your front porch, he’d come in saying Ho Ho Ho and deliver the gift to the kids. It was a great hit. When Addie was five, she ran to the door as he left and saw Santa get in to Ron’s SUV. Curtains on the Santa idea. She had it figured out as a hoax. One year later and she knows it all. She asked another neighbor’s child if she knew about Santa. The child said yes, on reflection a Yes that meant, “I know that Santa exists.” Which my daughter heard as “Yes, I know that parents do the Santa thing.” My daughter was off and running with the story of figuring out who Santa was. Neighbors were up in arms about my child blowing Santa’s cover. They told me it took all of their older children solemnly telling this youngest that Santa was real. The neighbors were absolutely sure that we’d made a mistake telling our child that what she discovered was true. Our child, however, still loved getting gifts and giving them, especially now that she knew that giving gifts was what made the holidays work so well. I was just talking with a co-worker about something similar. I must have been an early teenager and found all the presents wrapped in my mothers closet. I carefully peeled the tape off the end of each present “To Carol” and saw, much like you did, each and everything I had asked for. That Christmas, much like yours, was the absolute worst Christmas ever. Thirty some odd years later, I have never snooped again. If mine had been wrapped, I’d have never gotten away with it, Carol. Not even peeking in one end. I’m a total klutz with wrapping paper and tape. In my house we were not allowed to bug mom and dad awake until 6AM. Period. So somewhere in my early college years (I was one of the oldest) my high school sister and I decided to fix that. We were helping Santa by this time so it wasn’t too difficult to stay up past Mom & Dad and move all the clocks forward one hour. But when I went after Dad’s watch, it wasn’t on his nightstand. He was wearing it! We hurriedly switched all the clocks back and climbed into bed. Half-way through the presents Dad went into the kitchen to get a drink and asked why the stovetop clock said it was an hour later than his watch said. Apparently we’d missed that one! My classmates and I looked up “Santa Claus” in a children’s (of all places!)dictionary. It said something like father dresses up as Santa and delivers presents. We were all smart enough to keep our mouths shut for many years after that. Oh my! I guess they didn’t want to lie in a dictionary — but they could have just left it out! Oh the memories! A few days before the Big Event in 1937, I snooped by going up to the attic above the third floor in my grandmother’s home in Denver. Behold a pristine white doll bed was sitting among the stuff one finds in an attic. I was thrilled because I just knew it would soon be mine. My thirteen-year-old sister was soon on my tail and scolded me for being there-proof of my assumption of my soon to be ownership of said bed. She was really flustered and seemed to be at a loss for words. A first for her. She explained that the white be was for some other girl and it was being held there until Christmas Eve. I cannot remember if this incident crushed my Santa illusion but the bed found its way to our Christmas tree holding a Betsy Wetsy doll I still have. We were all childhood snoops, I see! Perhaps it’s that same “joy of uncertainty” that makes our genealogical discoveries so much sweeter. Merry Christmas, Judy! Oh, you’ve got that right for sure, Skip! Merry Christmas to you too! Suffered the same awful disappointment of “THE KNOWING”! Vowed to never do IT again! Learned my lesson……………the hard way….! Sorry Santa, I’ll be a good girl! Curiosity killed more than the cat, it seems. Lots of anticipation too! I was about the same age when I took my cousin, who was visiting from out of town, into the backyard to see our playhouse that we never played in anymore. Yikes, that playhouse was filled with toys! And there, right in front of me, was the Tiny Thumbelina doll I had asked Santa for. And imagine my surprise, along with a light bulb that instantly went off, when I opened a gift on Christmas morning and found that very doll! Ouch! Sure sounds like a give-away to me! My sister (7 years older) was definitely one for shaking the ones that had her name on them. The only time I carefully peeled the tape back, I too was sorry. It was the only time I did that. I think I was even disappointed one year when my mother found the gift that I was going to give to her, before I’d wrapped it! That would definitely be a bummer, Lisa, to have Mom discover her gift early! Judy, I can identify with exactly the emotions you went through. Our awful Christmas happened when I was 8 or 9, but no snooping was involved. When I was 3 my parents had moved from Texas to high up in the mountains of Colorado. By the time we had been there 5 or 6 years, my mother wanted in the worst way to spend Christmas with her family in Texas—so the trip was planned. My Dad liked to drive at night on long trips so we left the night before Christmas. No tree had been put up and we were allowed to open our gifts before we left. At some time during the night my dad had determined that we could not make it through the snow accumulation and we turned back for home. So we arrived back to a very cold house, no tree or decorations, no gifts, no Christmas food or goodies—and our mother so disappointed that she was almost in tears. I don’t think I ever asked her about that Christmas for as long as she lived. I know my dad wanted so badly to make that trip happen for my mother’s sake, but it was doomed before it started. He surely must have known in the deepest recesses of his mind that it would be impossible to travel through at least two months’ accumulation of snow on roads which probably would not have been deemed important enough to keep cleared. I guess he thought some Christmas magic would take place, and help us out. Awww… I love it that your Dad tried… and I sure wish there had been just enough Christmas magic to get you there. The one time we did this as children, my dad somehow knew. He returned all the presents and purchased new ones. We had a truly surprising Christmas that year. Oh now that is really cool! Good for your Dad! Great story and one with, apparently, near universal shared experience. It sure does seem to be pretty universal, doesn’t it? I too peeked at the stash one year. One item was my very first lipstick. My mother must have known because it never showed up on need the tree. Last time I ever peeked!